…At once accessible, yet challenging, there is a bristling and restless aura to Moravec’s fantasy on scenes and characters from Shakespeare’s ‘The Tempest’…There is real emotion in Moravec’s superbly constructed series of character vignettes…Moravec’s score has been widely performed and for good reason. Both musically complex and enticing to the ear, the Tempest Fantasy is an outstanding 21st-century addition to the chamber music literature. It was an even better idea when Gil Rose decided to put all six of the newly re-imagined Brandenburg concertos into a single program for Boston Modern Orchestra Project…It was easy to see why Rose saved Paul Moravec’s Brandenburg Gate (2008) [to] close. Its celebratory qualities suggest the same brilliance that Bach’s second concerto sustains throughout. The fast-slow-fast movements, entirely traditional for the genre, come from Moravec without breaks, readily achieving his goal (mentioned in the program note) of projecting a quality of “convivial energy.” Here, too, the B-A-C-H motto makes an appearance, but the runaway trumpet in the last movement gave the ending something of the joyous air of a circus, and brought listeners to their feet to greet the composer with rousing cheers. 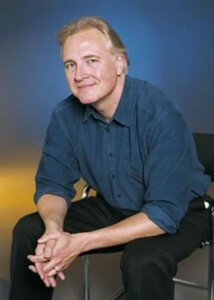 Paul Moravec’s Brandenburg Gate, a riff on the Second Brandenburg Concerto, is a musical depiction of the globe-changing events of 1989, when the Berlin Wall came down and the Brandenburg gate opened. Moravec’s nimble score brims with joyous energy, with strings, woodwinds, and solo trumpet dexterously trading serpentine phrases with each other. Moravec wrote music of descriptive power—the pizzicato string figures of the third movement, he noted, symbolize hammer and chisel sounds on the Berlin Wall…Rose led with a fine ear to the details of the piece, molding the sound with broad gestures. Disastrous winters live long in historical memory. For example, there is the blizzard that hit the Great Plains in January of 1888…Known as the Children’s Blizzard…The events of that fateful storm are memorialized in Paul Moravec’s stunning oratorio The Blizzard Voices, which Gil Rose and the Boston Modern Orchestra Project performed Thursday night at Jordan Hall in its Boston premiere. The libretto, based on survivors’ accounts [is] compiled by poet Ted Kooser…Moravec’s darkly tonal music captured these stories in powerful dramatic detail in this expansive, 70-minute work. The Prologue was haunting in its bare orchestral textures and wordless chorus. The blizzard scene was terrifying, the music a dense swirl of thick, thorny dissonances. Some of the writing involved colorful effects, such as bubbling orchestral rhythms and the chatter of the chorus to symbolize a telegraph machine. Other sections glowed with intensity. [Recently,] the Nashville Ballet [presented] “Emergence:” three new works for dance… each composed by Pulitzer Prize-winning composer Paul Moravec, including his Amorisms, a new work co-commissioned by the Nashville Ballet, Alias Chamber Ensemble and Portara Ensemble. Conductor Shreyas Patel led the Alias Chamber Ensemble and Portara Ensemble in James Gregg’s choreography for “In Waiting,” set to Moravec’s Sacred Love Songs…Portara made quite an impression…The religious text was quite a contrast to the seemingly secular movement which featured body throws, head tosses, dramatic, athletic movements (floor to standing on one foot, floor to standing on one hand, floor to standing on bench,) and severe angles. Portara joined Alias again at the end to perform Gina Patterson’s “I love you, I love you, I love you, I love you,” set to Moravec’s Amorisms. This work opens with performance art with dirt. There were mimes, and dirt, and flowers, singing, acting and jokes. This is not a tutu-ballet piece, and it is great fun…The future is incredibly inter-disciplinary and the comedic acting and singing in Amorisms is a very wonderful way to introduce… what’s coming [down the road]…Portara clearly loves singing this piece, and their enthusiasm significantly [added] to the performance…This weekend the Nashville Ballet [presented] fresh and contemporary works that explore timeless ideas in new ways. …Paul Moravec’s Amorisms and Sacred Love Songs (both performed with the splendid vocalists of Portara Ensemble) – explored various aspects of love…Amorisms [is] set to music five of Shakespeare’s aphorisms about love. Moravec wrote the piece as dance music (Portara and Alias will perform it with Nashville Ballet later this month), so rhythm and timbre, not Shakespeare’s words, are emphasized. Paul Moravec is a prolific American composer…His Piano Quintet is characterized by quickly changing moods, variations in rhythms and tempos, and lyrical passages interspersed with dramatic and dissonant sections. The darkly mysterious quickly becomes exciting and tense. The contemplative slow movement is tartly beautiful and ghostly eerie, always transforming. A beautiful cello melody precedes dissonant wandering strings in the central section of the final movement. It’s sandwiched between two sections of fast-paced passages led by the piano. This is a work that reveals and satisfies more upon repeated hearings. Jeremy Denk and the Lark Quartet navigate its complexities with verve and imagination. Most impressive [on this disc] is Paul Moravec’s 23-minute, profoundly conservative, deeply absorbing Piano Quintet, commissioned in 2006 to honor the philanthropist Adam Aronson. Amid the rigorous charting of its blueprinted lines, textures and occasional harmonic ecstasies, there are astonishing moments of physical beauty, such as [the piano’s] sumptuous solo opening the second movement. 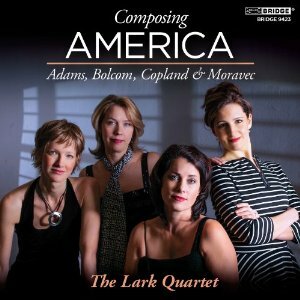 …the Piano Quintet by Paul Moravec allows the [Lark Quartet] to respond to their stiffest challenge of all as they interact with pianist Jeremy Denk in a work that keeps all our artists constantly alert for the diverse ways its shape is constantly changing through morphing blue notes, stacked fifths in the piano, and textures that are variously terse and spiky, broadly stated, and luminous. This work will reveal more of its beauties to the listener upon repeated audition, something for which the artists share credit with the composer. On Tuesday evening the Oratorio Society of New York presented a…new work by Paul Moravec, The Blizzard Voices. Mr. Moravec’s oratorio uses texts by the former poet laureate Ted Kooser, based on testimonies from survivors of the sudden storm that brought blinding snowfall [to] the Great Plains on Jan. 12, 1888. For the most part the music is tonal, and Mr. Moravec’s writing for the solo singers aims for an unaffected simplicity…The musical depiction of the outbreak of the storm was nothing short of terrifying. Yet in other parts the caressing strings and lilting vocal lines, the naïf settings of lullabies and children’s ditties that seemed intended to heighten the pathos, also acted as something of an analgesic. The concerto tends to be a heroic medium, with an esteemed virtuoso pitted against an army of orchestral musicians, both vying for musical foreground. As in Prokofiev’s Violin Concerto No. 1, the soloist’s entrance is usually quiet, a stealthy start on a soft bed of orchestral tone clusters, setting the stage for music that feels tonal but has the more open-ended sense of direction associated with atonal music. Often, I wondered “Where are we? Where are we headed?” – and felt fine not knowing.